Treated floor joist spaced 16″ apart. 25 yr 3 tab shingles. Prices include all material and labor for on-site construction. Buildings are unpainted. We do no site excavation. Buildings are leveled by using shims under the skids. Please allow 2-3 ft. of clearance around the site perimeter for work access. It is the customer’s responsibility to secure any and all appropriate building permits and to insure that their new shed is in compliance with any and all local ordinances prior to construction beginning. I was doing some google searching for barns/small buildings in SW Texas and found you. Wow, you do some amazingly awesome work! My question is this. I have a weekend property in Pattison Texas. It’s going to be my future retirement place. It has a small farmhouse on that I’ve been slowly fixing up. It’s also 11 acres, that I’ve been slowly clearing. The next thing I need is a barn. Right now the riding mower is just under a covered lean to and all my tools and weed eater and tiller etc are all inside the house, ha. Anyway, before I ramble on with my needs, I guess I just need to see if you’d come out that direction? It’s 126 miles from Austin to the farm. I noticed you went up to Abilene which is further and hoped you might come this direction? Pattison is just North of I-10 and the town of Brookshire (about 8 miles). It’s also about 12 miles from Katy, TX where there are plenty of Home Depot’s and Lowe’s. The barn I would need can’t be longer than about 24′ but it can be 16′ or a little wider. I had been looking at Tuff Shed because they seem to be the only thing I can find around here but they make me nervous, ha. I love the hand built nature of what you do (and the quality shows). The lofted barn style is exactly what I’d want. Sorry, Pattison would just be too far the wrong direction. I live between Austin and Abilene so I dont go very far past Austin. 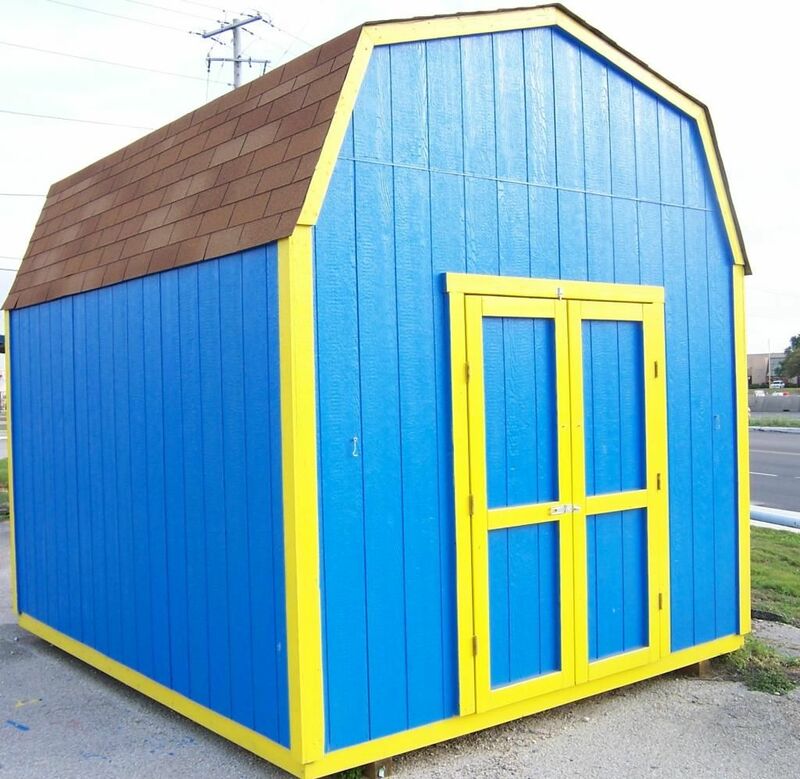 We are considering a 12′ x 20′ or a 12′ x 24′ lofted or gable portable building. What is the “clearance” for your doorway? I am 6′ and many models end up being a head banger. Do you use 2′ x 6′ floor joists for this size unit? Is the peak clearance for the height measured from the inside, or from the ground to the outside of the shed. Do you service haskell, tx? When you are building the longer barns like 12×20 or 12×24, how do you frame out the floor? Are you bringing in 20′ and 24′ long boards for the outside rails? I laminate 16′ and shorter boards together to create skids ( girder beams ) the full length of the building. Floor joist set on top of the skids spaces 16″ apart. The outside band boards are spliced at a floor joist. I currently have a metal shed on a 10×10 concrete slab that I want to replace. Can you build a 10×10 large barn on the existing slab? I noticed your smallest is a 10×12. or would an added 2 feet wood deck work to make it 10×12? Yes I can build a 10×10 on the slab. Also I could build a 10×12, the skids would simply hang off the slab to support the building. Jerry: Do you service Bastrop, Tx. area? We need a 10 x 12 Lofted barn. We live in the Tahitian village subdivision, just off Hwy 71 in Bastrop. What does your schedule look like, as we would like to have it done before the new year if possible. Talked to our HOA and we would need to get a building permit. So, not sure how long that would take. Thanks, and hope you have a blessed day. Jerry I would like to get a custom made lofted barn built. Do you build barns in San Angelo Texas? Please email me if you can build in San Angelo and the cost. We are interested in a 12 x 16 lofted barn with one extra single door at back end as well as decked loft on ends. We are located in Lubbock, Tx. Can you send quote as well as when you might be able to do this on site?